Chronic inflammatory conditions, such as rheumatoid arthritis (RA), are characterized by continuous pain and RA is the most frequent form of inflammatory joint disease in the United Kingdom  with an estimated economic cost of ~£8bn/year . Inflammation has several notable symptoms including the four cardinal ones described by Aulus Cornelius Celsus in his 1st century BC book De Medicina: rubor (redness), tumor (swelling), calor (heat) and dolor (pain). 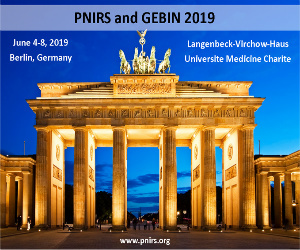 At the molecular level, there are numerous different mediators that drive these symptoms and a greater understanding of the mechanisms that produce pain has the potential to open up new avenues for the development of analgesics. One of the hallmarks of inflammation is tissue acidosis, which is largely attributable to lactic acid production through the glycolytic activity of infiltrated neutrophils . Continuing with RA as the example inflammatory condition, neutrophils are the most abundant cells in RA synovial fluid  and as such it should come as no surprise that joints from RA patients are often acidic. The most extreme pH measured in RA synovial fluid is pH 6.0 and although other studies have reported less acidic values , a pH below pH 7.0 is not uncommon. Moreover, in studies using healthy human volunteers, solutions of pH 7.0 are sufficient to evoke pain  and thus the tissue acidosis that occurs in RA is thus sufficient to trigger acid-mediated pain. In the 1920s it was demonstrated that the pain arising from an inflamed abscess could be relieved by the injection of an alkaline phosphate buffer to neutralize the acidic nature of the abscess , which demonstrates the relationship between acid and pain. However, injection of alkaline phosphate buffers is far from a practical method of pain relief and thus it is important to understand how exactly acid generates pain. Sensory neurons can be divided into three main classes: Aβ-fibers, Aδ-fibers and C-fibers. Aβ-fibers are large diameter, myelinated fibers that innervate defined structures, such as Meissner corpuscles and hair follicles, and they are responsible for detecting non-noxious mechanical stimuli [9–11]. By contrast, Aδ-fibers have a narrower diameter and a thinner myelin sheath (resulting in a slower conduction velocity than Aβ-fibers) and can be subdivided into two classes: D-hair mechanoreceptors and Aδ-mechanonociceptors, the former are low-threshold mechanoreceptors, whereas the latter are only activated by high-intensity, noxious stimuli [9–11]; nociceptor is derived from the Latin nocere meaning to hurt/harm and thus a nociceptor is a receptor for hurtful/harmful stimuli. Lastly, C-fibers are narrow diameter, unmyelinated sensory neurons that can be split into many different groups, the majority of which are nociceptors: C-polymodal nociceptors (CP, activated by noxious thermal, mechanical and chemical stimuli), C-mechanonociceptors (CM, activated by noxious mechanical stimuli). C-mechanoheat (CMH, activated by noxious mechanical and heat stimuli), C-mechanocold (CMC, activated by noxious mechanical and cold stimuli), C-heat (CH, activated by noxious heat stimuli), C-low-threshold (CLT, non-nociceptive C-fibers activated by touch stimuli) and silent C-fibers (CS, quiescent fibers that become active during the sensitization processes in inflammation) [10–12] (Figure 1). It is thus clear that not all sensory neurons are equal and in terms of generating pain, it is the sensory properties of nociceptors that are most important. Figure 1. 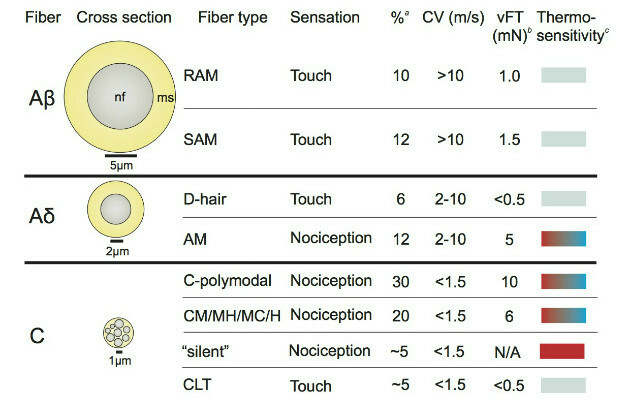 Mammalian cutaneous fiber types. Diameters refer to cat fibers . Column superscripts as follows: a, percentages ; b, mechanical thresholds from multiple sources  and c, thermosensitivity refers to the ability to detect noxious hot (red) or cold (blue). Abbreviations: nf, nerve fiber, ms myelin sheath, CV conduction velocity, vFT von Frey threshold, mN milli Newtons, RAM rapidly adapting mechanoreceptor, SAM slowly adapting mechanoreceptor, AM Aδ-mechanonociceptor, CM C-mechanonociceptor, CMH C-mechanoheatnociceptor, CMC C-mechanocold nociceptor, CH C-heatnociceptor and CLT C-low threshold fiber. Taken from Reference 11 (Open Access, Public Domain). pH can modulate the function of a wide variety of ion channels and receptors, but the majority of attention has been focused upon transient receptor potential vanilloid 1 (TRPV1) and the acid-sensing ion channel (ASIC) family. TRPV1 is a polymodal ion channel, which is expressed by a significant proportion of nociceptors and is activated by heat, capsaicin and protons. However, under non-inflammatory conditions, TRPV1 requires very acidic conditions to be activated and has a pH50 (the pH required for half-maximal channel activation) of pH 5.4 . Consequently, it is questionable as to how much of a role TRPV1 can have in detecting tissue acidosis under control conditions. Indeed, studies in healthy human volunteers have demonstrated that inhibition of TRPV1 failed to alleviate the pain generated by a pH 6.0 solution, but was able to reduce the pain produced by a more acidic, pH 5.0 solution . However, a key characteristic of TRPV1 is that upon activation by protons it does not inactivate and thus prolonged TRPV1 activation produces prolonged neuronal depolarization. This prolonged TRPV1-mediated depolarization could act to sensitize the neuron to further stimuli should it be insufficient to activate the neuron itself. Of great interest to acid-mediated pain in inflammation, TRPV1 can be sensitized by a plethora of inflammatory mediators (discussed in detail below), which suggests that during inflammation acid-mediated TRPV1 activation could activate nociceptors. From a structural perspective, TRPV1 forms ion channels that consist of four subunits  and protons modulate channel activation via two extracellular glutamates. Proton binding to E600 mediates the sensitizing effects of protons to TRPV1 activation by other stimuli, such as heat, whereas E648 mediates direct proton-mediated gating of TRPV1 . By contrast, intracellular acidosis appears to inhibit TRPV1 activation , which in inflammation could represent a mechanism by which channel activity is limited because TRPV1 is itself permeable to protons  and thus acid-evoked TRPV1 activation produces proton influx (along with sodium, calcium etc. ), which can then inhibit channel activation intracellularly. Unlike TRPV1, which requires large drops in extracellular pH to be activated, ASICs appear perhaps better suited to detect the levels of acidity generated during inflammation. Indeed, studies using healthy volunteers have shown that ASIC inhibition reduces the pain induced by a pH 7.0 stimulus. There are four ASIC genes that encode six ASIC subunits because the ASIC1 and ASIC2 genes produce splice variants: ASIC1a, ASIC1b, ASIC2a, ASIC2b, ASIC3 and ASIC4[19,20]. When expressed in heterologous expression systems, activation of ASICs by acid produces a characteristic rapidly activating inward current that, depending upon the subunit, is sensitive to more modest drops in pH than TRPV1: ASIC1a pH50 = pH 5.8, ASIC1b pH50 = pH 6.1, ASIC2a pH50 = 4.5 and ASIC3 pH50 = 6.4 ;neither ASIC2b , nor ASIC4  form acid-sensitive homomers. Three ASIC subunits come together to form functional ion channels [24,25] and both in heterologous systems and in vivo there is evidence to suggest that both homomeric and heteromeric ASIC trimers are formed with ASIC2b and ASIC4 having modulatory activity [21,22,26–28].Recent evidence demonstrates that the stoichiometry of ASIC trimers is not fixed, such that in cells transfected with ASIC1a and ASIC2a four distinct populations of ion channels are present: ASIC1a homomers, ASIC2a homomers and ASIC1a/2a heteromers with either a 2:1 or 1:2 ratio . How acid activates ASICs is still not fully understood, although early studies identified that extracellular protons were required for ASIC activation . The crystal structure of ASIC1a identified a region called the acid pocket, which contains three carboxylate pairs (D238–D350, E239–D346 and E220–D408; ASIC1a numbering), which were hypothesized to be the primary sites for pH sensing . However, mutation of these residues, although diminishing the acid-sensitivity of ASICs, does not fully abolish their activation [31,32]. Moreover, the ASIC2 splice variants ASIC2a and ASIC2b both contain all the carboxylates of the acid pocket with the exception of D350, which demonstrates that the six carboxylates alone are neither necessary nor sufficient for ASIC activation by protons because ASIC2a and ASIC2b are acid-sensitive and acid-insensitive respectively, e.g. amino acids outside of the acid pocket are important for ASIC proton sensing. Indeed, studies have identified several other residues that are necessary for normal activation of ASIC1a [31–34] and comparison of the acid-sensitive ASIC2a with its acid-insensitive splice variant ASC2b identified five amino acids in ASIC2a that when mutated fully abolished acid activation of ASIC2a without affecting trafficking to the cell membrane [27,35]. Two of the amino acids identified in this study were D77 and E78, which are also involved in the acid sensitivity of ASIC1a ; D77 and E78 are located in the extracellular domain, just after the first transmembrane domain, suggesting that this domain is critical in determining ASIC proton sensitivity. Although drops in extracellular pH rapidly activate ASICs, the currents almost fully inactivate within 1-2 seconds. Moreover, ASICs undergo a phenomenon termed steady-state-inactivation (SSI), whereby channels exposed to very mild acidosis can enter a desensitized state without first entering an activated state . Thus SSI, combined with rapid inactivation does not suggest that ASICs could feasibly encode prolonged tissue acidosis as painful because they would be switched off. However, ASIC3 and certain ASIC heteromers produce a sustained current that does not fully inactivate in the presence of low pH [21,27,37,38] and therefore these currents likely depolarize the resting membrane potential of nociceptors during tissue acidosis. In addition to TRPV1 and ASICs, which are activated by extracellular acid to evoke neuronal depolarization, certain two-pore domain potassium channels, which usually leak potassium out of the cell and help control the resting membrane potential, are inhibited by acid, which also causes neuronal depolarization. The two key proteins are TWIK-related (tandem of pore domains in a weakly inwardly rectifying K+ channel) acid-sensitive K+ channel family, TASKs, namely TASK1 and TASK3 . Because TASKs are constitutively active, their inhibition produces sustained changes in membrane potential, which could help contribute to the chronic pain experienced during chronic tissue acidosis. To date there has been little detailed analysis of their function in sensory neurons, although in mouse nociceptors sustained acid-gated currents have been recorded that are insensitive to TRPV1 inhibition and likely represent current that is mediated by acid inhibition of TASKs , a similar result was observed in human sensory neurons . See Figure 2 for a summary of the main acid-activation pathways in nociceptors. Figure 2. Nociceptors express many ion channels that are modulated by acid to produce depolarization: TRPV1, ASICs and certain TASK channels. If depolarization is great enough to reach the activation threshold of voltage-gated sodium channels (NaVs) then an action potential can be initiated. Action potential generation therefore has 2 phases: 1) activation of the transduction channel and 2) action potential initiation via NaV activation. One further ion channel that is worth mentioning is another member of the TRP ion channel family, TRPA1, which can be activated by intracellular protons in rodents  and the human variant has recently been identified to be activated by extracellular protons as well . Finally, one last factor to consider is how neurons cope with chronic tissue acidosis in terms of maintaining a stable intracellular pH. Numerous exchangers, located in the cell membrane, are involved in homeostatic control of cellular pH, one family of which are the sodium-hydrogen exchangers (NHE) that exchange one hydrogen ion out of the cell for one sodium ion into the cell. When experiencing extracellular acidosis, NHE isoforms are working against a concentration gradient and through pumping hydrogen ions less efficiently out of the cell it has been proposed that nociceptors could be depolarized through a buildup of intracellular hydrogen ions. A key factor to inflammation is that a variety of mediators are released from cells at the site of inflammation that result in sensitization of nociceptors, which means that stimuli evoke greater responses than before inflammation. For a patient this means that previously innocuous stimuli become painful (allodynia) and that painful stimuli generate greater pain (hyperalgesia). Some of the pathways by which acid-sensitive ion channels are sensitized will now be described. TRPV1 is modulated through a variety of different cellular pathways. For example, prostaglandin E2 (PGE2, the synthesis of which is inhibited by non-steroidal anti-inflammatory drugs such as ibuprofen) acts at EP4 receptors to generate cyclic adenosine monophosphate (cAMP), which in turn causes activation of protein kinase A (PKA). The action of PKA is to phosphorylate S116 on TRPV1, which sensitizes the response of TRPV1 to protons . PKA is targeted to TRPV1 by a scaffolding protein called A kinase anchoring protein (AKAP) and it has recently been demonstrated, both in vitro and in vivo that disrupting the interaction of TRPV1 with AKAP79/150 can prevent TRPV1 sensitization and inflammatory hyperalgesia [46–48]. Disrupting the AKAP-TRPV1 interaction is an ideal way to reduce pain because it prevents TRPV1 from being sensitized, but does not block its function as a channel antagonist would do, therefore it can still play its usual role in sensing noxious stimuli. This is a pertinent point because TRPV1 antagonists can produce an increased heat-pain threshold in non-sensitized skin , which could have deleterious effects in patients because of the increased risk of accidental burning.A further key phosphorylation event is PKC-mediated phosphorylation of S502 and S800, which is initiated by the action of bradykinin at B2 receptors, or other mediators that activate PKC signaling. Activation of PKC also has effects upon ASIC2-containing ASICs because the conserved C-terminus of ASIC2 interacts with a protein called protein interacting with C kinase (PICK1), which although itself has no influence over the gating properties of ASIC2 enables PKC to efficiently interact and phosphorylated ASICs produce currents of larger magnitude [52,53]. Phosphorylation by PKA or PKC is a relatively rapid event, but nerve growth factor (NGF) is able to produce both rapid and prolonged effects upon nociceptor function. Rapid events are the result of increased trafficking of TRPV1 to the nociceptor membrane (more channels available for activation)and removal of inhibition by phosphatidylinositol 4,5-bisphosphate (PIP2, reduced threshold for thermal activation) , whereas the prolonged effect is due to an upregulation of gene transcription for a variety of ion channels including TRPV1 and ASICs . (Readers are direct towards Lewin et al. for a detailed overview of NGF signaling in pain). Clearly then with tissue acidosis occurring in inflammation there is the possibility for acid-sensitive ion channels to be activated and the plethora of inflammatory mediators present means that they are sensitized and able to produce greater responses to the protons present. What evidence is there then for a role of TRPV1 and ASICs in inflammatory pain? In a variety of acute inflammatory models TRPV1-/- and ASIC3-/- mice show decreased pain behaviors, for example intraplantar complete Freund’s adjuvant (CFA) [59,60], intramuscular acid injection [61,62], as well as injection of CFA/carrageenan directly into joints . A reduction in pain behaviors is also observed in investigations that have used RNA interference to decrease the expression of acid-sensitive ion channels in intraplantar carrageenan and CFA inflammatory models 65–67]. Lastly, pharmacological inhibition of ASICs/TRPV1 has been shown to reduce pain behaviors in inflammatory models such as the CFA model[65,68,69]. In terms of chronic inflammation, two recent studies show that ASIC3 in particular has multiple roles in arthritis: ASIC3-/- mice display increased inflammation alongside decreased pain in collagen antibody-induced arthritis  and acid activation of ASIC3 induces synoviocyte cell death, which may contribute to reduced joint damage. By contrast there has been relatively little research on the contribution of TASKs to inflammatory pain although a few studies have demonstrated altered expression levels occurring during conditions associated with pain [72,73]. The ability to detect acid as a noxious stimulus is conserved among a variety of different organisms, from the nematode worm Caenorhabditis elegans to the medicinal leech Hirudo medicinalis and from the rainbow trout Oncorhynchus mykiss to mammals including the standard laboratory mouse Mus musculus and humans Homo sapiens. Therefore, it was quite unusual to observe that the naked mole-rat Heterocephalus glaber displays no acid-evoked pain. This likely represents an adaptation to the fact that naked mole-rats live in large colonies underground, which results in a hypercapnic/hypoxic environment . Carbon dioxide (CO2) reacts with water to produce bicarbonate and protons (CO2 + H2O ⇌ H2CO3⇌ HCO3– + H+) and thus animals living in a hypercapnic environment either have to endure CO2-evoked pain, or adapt to become resistant to this phenomena. It has been demonstrated that naked mole-rat nociceptors express the usual array of acid sensors (TRPV1, ASICs and TASKs) and they display similar acid-sensitivity to the homologous proteins in mice . 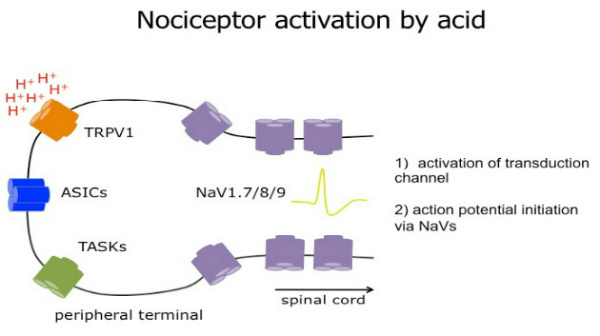 In order for action potentials to be generated in nociceptors, voltage-gated sodium channels (NaV) need to be activated; these ion channels are the site of action for local anesthetics and blocking their function prevents action potential generation, nerve conduction and the sensation of pain. It was observed that current mediated by NaV subunits in naked mole-rat nociceptors undergoes enhanced inhibition by acid compared to NaV-mediated current in mouse nociceptors. Studies examining the molecular basis for this difference identified that the naked mole-rat NaV subunit NaV1.7 has an amino acid motif that confers enhanced acid-inhibition: KKV is exchanged for EKE and the charge of this motif changes from ++0 to -0-. This increased negative charge of naked mole-rat NaV1.7 was hypothesized to produce increased attraction for protons, which might mediate the increased acid-inhibition of naked mole-rat NaVs and experiments demonstrated that this was indeed the case: mutation of human NaV1.7 from KKV to EKE producedgreater acid-inhibition of NaV1.7 than of the wild-type channel. Therefore, it was concluded that in nociceptors there is always a balance between acid-mediated depolarization (produced by ASIC/TRPV1 activation and TASK inhibition) and acid-mediated inhibition of NaVs. In most species acid-mediated depolarization is more powerful than acid-inhibition of NaVs and acid elicits action potentials and pain, but in naked mole-rats the NaV inhibition is so strong that acid acts like an anesthetic and fails to evoke action potentials resulting in an animal that displays no acid-mediated pain (Figure 3). Figure 3. The balance between acid-activation and acid-inhibition in nociceptor action potential firing. A, Acid evokes transient, ASIC-like responses (left) and sustained, TRPV1-like responses (right) in nociceptors. B, Acid inhibits voltage-gated sodium (NaV) currents activated by a voltage-step protocol. C, Acid-evoked action potential generation is a balance between ASIC/TRPV1-mediated depolarization and inhibition of NaVs; in mice, depolarization often out balances NaV inhibition in nociceptors resulting in action potential generation and pain, by contrast, in the naked mole-rat the inhibition is so strong that action potentials are not produced and they do not perceive acid as painful. For more information, see . Not only does this work demonstrate the important role for NaV1.7 in the acid-pain pathway, but it has since been shown that the EKE motif is conserved in a variety of hibernating species  and other subterranean animals [77,78], which are also exposed to high levels of CO2 and thus this likely represents a molecular form of convergent evolution. In summary, tissue acidosis is common to many inflammatory conditions and can drive pain by modulation of ion channels that are expressed by those sensory neurons that detect noxious stimuli, nociceptors. During inflammation, a variety of inflammatory mediators modulate the properties of the different acid-sensitive proteins so that they are sensitized resulting in channels that are activated by milder stimulation and produce greater responses. Understanding more about the molecular mechanisms by which acid can cause pain could identify novel therapeutic targets for the treatment of inflammatory pain. ASIC, acid-sensing ion channel; AKAP, A kinase anchoring protein; NHE, sodium-hydrogen exchanger; PKA/C, protein kinase A/C; TRPV1, transient receptor potential vanilloid 1; SSI, steady-state-inactivation; TASK, TWIK-related (tandem of pore domains in a weakly inwardly rectifying K+ channel) acid-sensitive K+ channel family; NaV, voltage-gated sodium channels. Ewan St. John Smith – Department of Pharmacology, University of Cambridge, Tennis Court Road, Cambridge, CB2 1PD, United Kingdom. E. St. J. S. is funded by the Royal Society and the International Association for the Study of Pain. 1. Symmons D, Turner G, Webb R, et al. The prevalence of rheumatoid arthritis in the United Kingdom: new estimates for a new century. Rheumatol 2002; 41: 793–800. 2. Von Radowitz J. Rheumatoid arthritis “costs up to £8bn a year.” The Independent. http://ind.pn/MrlJcR. Published March 31, 2010. Accessed April 13, 2012. 3. Lardner A. The effects of extracellular pH on immune function. J Leukoc Biol 2001; 69: 522–30. 4. Németh T, Mócsai A. The role of neutrophils in autoimmune diseases. Immunol Lett 2012; 143: 9–19. 5. Goldie I, Nachemson A. Synovial pH in rheumatoid knee-joints. I. The effect of synovectomy. Acta Orthop Scand 1969; 40: 634–41. 6. Falchuk KH, Goetzl EJ, Kulka JP. Respiratory gases of synovial fluids. An approach to synovial tissue circulatory-metabolic imbalance in rheumatoid arthritis. Am J Med 1970; 49: 223–31. 7. Ugawa S, Ueda T, Ishida Y, Nishigaki M, Shibata Y, Shimada S. Amiloride-blockable acid-sensing ion channels are leading acid sensors expressed in human nociceptors. J Clin Invest 2002; 110: 1185–90. 8. Von Gaza W, Brandi B. Die Beseittigung des Entzündungsschmerzes durch Gewerbsalkalisierung. Klin Wochen 1927; 6: 11–3. 9. Lynn B. The fibre composition of cutaneous nerves and the classification and response properties of cutaneous afferents, with particular reference to nociception. Pain Rev 1994; 1: 172–83. 10. Lewin GR, Moshourab R. Mechanosensation and pain. J Neurobiol 2004; 61: 30–44. 11. Smith ES, Lewin GR. Nociceptors: a phylogenetic view. J Comp Physiol A 2009; 195: 1089–106. 12. Dubin AE, Patapoutian A. Nociceptors: the sensors of the pain pathway. J Clin Invest 2010; 120: 3760–72. 13. Caterina MJ, Schumacher MA, Tominaga M, Rosen TA, Levine JD, Julius D. The capsaicin receptor: a heat-activated ion channel in the pain pathway. Nature 1997; 389: 816–24. 14. Tominaga M, Caterina MJ, Malmberg AB, et al. The cloned capsaicin receptor integrates multiple pain-producing stimuli. Neuron 1998; 21: 531–43. 15. Liao M, Cao E, Julius D, Cheng Y. Structure of the TRPV1 ion channel determined by electron cryo-microscopy. Nature 2013; 504: 107–12. 16. Jordt SE, Tominaga M, Julius D. Acid potentiation of the capsaicin receptor determined by a key extracellular site. Proc Natl Acad Sci 2000; 97: 8134–9. 17. Chung S, Kim Y-H, Koh J-Y, Nam T-S, Ahn D-S. Intracellular acidification evoked by moderate extracellular acidosis attenuates transient receptor potential V1 (TRPV1) channel activity in rat dorsal root ganglion neurons. Exp Physiol 2011; 96: 1270–81. 18. Vulcu S., Liewald J., Gillen C, Rupp J, Nawrath H. Proton conductance of human transient receptor potential–vanilloid type-1 expressed in oocytes of Xenopus laevis and in Chinese hamster ovary cells. Neurosci 2004; 125: 861–6. 19. Wemmie JA, Taugher RJ, Kreple CJ. Acid-sensing ion channels in pain and disease. Nat Rev Neurosci 2013; 14: 461–71. 20. Lingueglia E. Acid-sensing ion channels in sensory perception. J Biol Chem 2007; 282: 17325–9. 21. Hesselager M, Timmermann DB, Ahring PK. pH Dependency and desensitization kinetics of heterologously expressed combinations of acid-sensing ion channel subunits. J Biol Chem 2004; 279: 11006–15. 22. Lingueglia E, de Weille JR, Bassilana F, et al. A modulatory subunit of acid sensing ion channels in brain and dorsal root ganglion cells. J Biol Chem 1997; 272: 29778–83. 23. Akopian AN, Chen CC, Ding Y, Cesare P, Wood JN. A new member of the acid-sensing ion channel family. Neuroreport 2000; 11: 2217–22. 24. Jasti J, Furukawa H, Gonzales EB, Gouaux E. Structure of acid-sensing ion channel 1 at 1.9 A resolution and low pH. Nature 2007; 449: 316–23. 25. Carnally SM, Dev HS, Stewart AP, et al. Direct visualization of the trimeric structure of the ASIC1a channel, using AFM imaging. Biochem Biophys Res Comm 2008; 372: 752–5. 26. Donier E, Rugiero F, Jacob C, Wood JN. Regulation of ASIC activity by ASIC4–new insights into ASIC channel function revealed by a yeast two-hybrid assay. Eur J Neurosci 2008; 28: 74–86. 27. Smith ES, Zhang X, Cadiou H, McNaughton PA. Proton binding sites involved in the activation of acid-sensing ion channel ASIC2a. Neurosci Lett 2007; 426: 12–7. 28. Chen X, Paukert M, Kadurin I, Pusch M, Grunder S. Strong modulation by RFamide neuropeptides of the ASIC1b/3 heteromer in competition with extracellular calcium. Neuropharm 2006; 50: 964–74. 29. Bartoi T, Augustinowski K, Polleichtner G, Gründer S, Ulbrich MH. Acid-sensing ion channel (ASIC) 1a/2a heteromers have a flexible 2:1/1:2 stoichiometry. Proc Natl Acad Sci USA 2014; 111: 8281–6. 30. Waldmann R, Champigny G, Bassilana F, Heurteaux C, Lazdunski M. A proton-gated cation channel involved in acid-sensing. Nature 1997; 386: 173–7. 31. Paukert M, Chen X, Polleichtner G, Schindelin H, Grunder S. Candidate amino acids involved in H+ gating of acid-sensing ion channel 1a. J Biol Chem 2008; 283: 572–81. 32. Li T, Yang Y, Canessa CM. Interaction of the aromatics Tyr-72/Trp-288 in the interface of the extracellular and transmembrane domains is essential for proton gating of acid-sensing ion channels. J Biol Chem 2009; 284: 4689–94. 33. Liechti LA, Bernèche S, Bargeton B, et al. A Combined Computational and Functional Approach Identifies New Residues Involved in pH-dependent Gating of ASIC1a. J Biol Chem 2010; 285: 16315–29. 34. Della Vecchia MC, Rued AC, Carattino MD. Gating transitions in the palm domain of ASIC1a. J Biol Chem 2013; 288: 5487–95. 35. Baron A, Schaefer L, Lingueglia E, Champigny G, Lazdunski M. Zn2+ and H+ are coactivators of acid-sensing ion channels. J Biol Chem 2001; 276: 35361–7. 36. Babini E, Paukert M, Geisler HS, Grunder S. Alternative splicing and interaction with di- and polyvalent cations control the dynamic range of acid-sensing ion channel 1 (ASIC1). J Biol Chem 2002; 277: 41597–603. 37. Yagi J, Wenk HN, Naves LA, McCleskey EW. Sustained currents through ASIC3 ion channels at the modest pH changes that occur during myocardial ischemia. Circ Res 2006; 99: 501–9. 38. Salinas M, Lazdunski M, Lingueglia E. Structural elements for the generation of sustained currents by the acid pain sensor ASIC3. J Biol Chem 2009; 284: 31851–9. 39. Holzer P. Acid-sensitive ion channels and receptors. Handb Exp Pharm 2009; 194: 283–332. 40. Smith ESJ, Omerbašić D, Lechner SG, Anirudhan G, Lapatsina L, Lewin GR. The Molecular Basis of Acid Insensitivity in the African Naked Mole-Rat. Science 2011; 334: 1557–60. 41. Baumann TK, Chaudhary P, Martenson ME. Background potassium channel block and TRPV1 activation contribute to proton depolarization of sensory neurons from humans with neuropathic pain. Eur J Neurosci 2004; 19: 1343–51. 42. Wang YY, Chang RB, Liman ER. TRPA1 Is a Component of the Nociceptive Response to CO2. J Neurosci 2010; 30: 12958–63. 43. De la Roche J, Eberhardt MJ, Klinger AB, et al. The molecular basis for species-specific activation of human TRPA1 protein by protons involves poorly conserved residues within transmembrane domains 5 and 6. J Biol Chem 2013; 288: 20280–92. 44. Torres-Lopez JE, Guzman-Priego CG, Rocha-Gonzalez HI, Granados-Soto V. Role of NHE1 in Nociception. Pain Res Treat 2013; 2013: 217864. 45. Bhave G, Zhu W, Wang H, Brasier D., Oxford GS, Gereau IV RW. cAMP-Dependent Protein Kinase Regulates Desensitization of the Capsaicin Receptor (VR1) by Direct Phosphorylation. Neuron 2002; 35: 721–31. 46. Zhang X, Li L, McNaughton PA. Proinflammatory Mediators Modulate the Heat-Activated Ion Channel TRPV1 via the Scaffolding Protein AKAP79/150. Neuron 2008; 59: 450–61. 47. Btesh J, Fischer MJM, Stott K, McNaughton PA. Mapping the binding site of TRPV1 on AKAP79: implications for inflammatory hyperalgesia. J Neurosci 2013; 33: 9184–93. 48. Fischer MJM, Btesh J, McNaughton PA. Disrupting sensitization of transient receptor potential vanilloid subtype 1 inhibits inflammatory hyperalgesia. J Neurosci 2013; 33: 7407–14. 49. Chizh BA, O’Donnell MB, Napolitano A, et al. The effects of the TRPV1 antagonist SB-705498 on TRPV1 receptor-mediated activity and inflammatory hyperalgesia in humans. Pain 2007; 132: 132–41. 50. Numazaki M, Tominaga T, Toyooka H, Tominaga M. Direct phosphorylation of capsaicin receptor VR1 by protein kinase Cepsilon and identification of two target serine residues. The Journal of biological chemistry 2002; 277: 13375–8. 51. Hruska-Hageman AM, Wemmie JA, Price MP, Welsh MJ. Interaction of the synaptic protein PICK1 (protein interacting with C kinase 1) with the non-voltage gated sodium channels BNC1 (brain Na+ channel 1) and ASIC (acid-sensing ion channel). The Biochemical journal 2002; 361: 443–50. 52. Baron A, Deval E, Salinas M, Lingueglia E, Voilley N, Lazdunski M. Protein kinase C stimulates the acid-sensing ion channel ASIC2a via the PDZ domain-containing protein PICK1. The Journal of biological chemistry 2002; 277: 50463–8. 53. Deval E, Salinas M, Baron A, Lingueglia E, Lazdunski M. ASIC2b-dependent regulation of ASIC3, an essential acid-sensing ion channel subunit in sensory neurons via the partner protein PICK-1. J Biol Chem 2004; 279: 19531–9. 54. Zhang X, Huang J, McNaughton PA. NGF rapidly increases membrane expression of TRPV1 heat-gated ion channels. EMBO J 2005; 24: 4211–23. 55. Cao E, Cordero-Morales JF, Liu B, Qin F, Julius D. TRPV1 Channels Are Intrinsically Heat Sensitive and Negatively Regulated by Phosphoinositide Lipids. Neuron 2013; 77: 667–79. 56. Ji R-R, Samad TA, Jin S-X, Schmoll R, Woolf CJ. p38 MAPK Activation by NGF in Primary Sensory Neurons after Inflammation Increases TRPV1 Levels and Maintains Heat Hyperalgesia. Neuron 2002; 36: 57–68. 57. Mamet J, Lazdunski M, Voilley N. How nerve growth factor drives physiological and inflammatory expressions of acid-sensing ion channel 3 in sensory neurons. J Biol Chem 2003; 278: 48907–13. 58. Lewin GR, Lechner SG, Smith ESJ. Nerve growth factor and nociception: From experimental embyrology to new analgesic therapy. Handb Exp Pharmacol 2014; 220: in press. 59. Caterina MJ, Leffler A, Malmberg AB, et al. Impaired nociception and pain sensation in mice lacking the capsaicin receptor. Science 2000; 288: 306–13. 60. Staniland AA, McMahon SB. Mice lacking acid-sensing ion channels (ASIC) 1 or 2, but not ASIC3, show increased pain behaviour in the formalin test. Eur J Pain 2009; 13: 554–63. 61. Price MP, McIlwrath SL, Xie J, et al. The DRASIC cation channel contributes to the detection of cutaneous touch and acid stimuli in mice. Neuron 2001; 32: 1071–83. 62. Sluka KA, Radhakrishnan R, Benson CJ, et al. ASIC3 in muscle mediates mechanical, but not heat, hyperalgesia associated with muscle inflammation. Pain 2007; 129: 102–12. 63. Keeble J, Russell F, Curtis B, Starr A, Pinter E, Brain SD. Involvement of transient receptor potential vanilloid 1 in the vascular and hyperalgesic components of joint inflammation. Arth Rheum 2005; 52: 3248–56. 64. Ikeuchi M, Kolker SJ, Burnes LA, Walder RY, Sluka KA. Role of ASIC3 in the primary and secondary hyperalgesia produced by joint inflammation in mice. Pain 2008; 137: 662–9. 65. Deval E, Noel J, Lay N, et al. ASIC3, a sensor of acidic and primary inflammatory pain. EMBO J 2008; 27: 3047–55. 66. Kasama S, Kawakubo M, Suzuki T, Nishizawa T, Ishida A, Nakayama J. RNA interference-mediated knock-down of transient receptor potential vanilloid 1 prevents forepaw inflammatory hyperalgesia in rat. Eur J Neurosci 2007; 25: 2956–63. 67. Diochot S, Baron A, Salinas M, et al. Black mamba venom peptides target acid-sensing ion channels to abolish pain. Nature 2012; 490: 552–5. 68. Nash MS, McIntyre P, Groarke A, et al. 7-tert-Butyl-6-(4-Chloro-Phenyl)-2-Thioxo-2,3-Dihydro-1H-Pyrido[2,3-d]Pyrimidin-4-One, a Classic Polymodal Inhibitor of Transient Receptor Potential Vanilloid Type 1 with a Reduced Liability for Hyperthermia, Is Analgesic and Ameliorates Visceral Hypersensitivity. JPET 2012; 342: 389–98. 69. Dube GR, Lehto SG, Breese NM, et al. Electrophysiological and in vivo characterization of A-317567, a novel blocker of acid sensing ion channels. Pain 2005; 117: 88–96. 70. Sluka KA, Rasmussen LA, Edgar MM, et al. Acid-Sensing Ion Channel 3 Deficiency Increases Inflammation but Decreases Pain Behavior in Murine Arthritis. Arth Rheum 2013; 65: 1194–202. 71. Gong W, Kolker SJ, Usachev Y, et al. Acid-sensing ion channel 3 decreases phosphorylation of extracellular signal-regulated kinases and induces synoviocyte cell death by increasing intracellular calcium. Arth Res Therap 2014; 16: R121. 72. Marsh B, Acosta C, Djouhri L, Lawson SN. Leak K+ channel mRNAs in dorsal root ganglia: relation to inflammation and spontaneous pain behaviour. Mol Cell Neurosci 2012; 49: 375–86. 73. Pollema-Mays SL, Centeno MV, Ashford CJ, Apkarian AV, Martina M. Expression of background potassium channels in rat DRG is cell-specific and down-regulated in a neuropathic pain model. Mol Cell Neurosci 2013; 57: 1–9. 74. Park TJ, Lu Y, Juttner R, et al. Selective inflammatory pain insensitivity in the African naked mole-rat (Heterocephalus glaber). PLoS Biol 2008; 6: e13. 75. Edrey YH, Park TJ, Kang H, Biney A, Buffenstein R. Endocrine function and neurobiology of the longest-living rodent, the naked mole-rat. Exp Gerontol 2011; 46: 116–23. 76. Liu Z, Wang W, Zhang T-Z, et al. Repeated functional convergent effects of NaV1.7 on acid insensitivity in hibernating mammals. Proc Biol Sci 2014; 281: 20132950. 77. Fang X, Nevo E, Han L, et al. Genome-wide adaptive complexes to underground stresses in blind mole rats Spalax. Nat Commun 2014; 5: 3966. 78. Fang X, Seim I, Huang Z, et al. Adaptations to a subterranean environment and longevity revealed by the analysis of mole rat genomes. Cell Rep 2014; 8: 1354–64.